It was late one night years ago when I just a kid. I had crept downstairs for a late night snack, when I heard what sounded like my mom crying. All I could think was that my parents probably had a fight that got far too intense. I crept towards her sobs, put my face around to corner of the wall, expecting the worse. Was I saw was not expected. I saw the tops of my mom and dad heads. 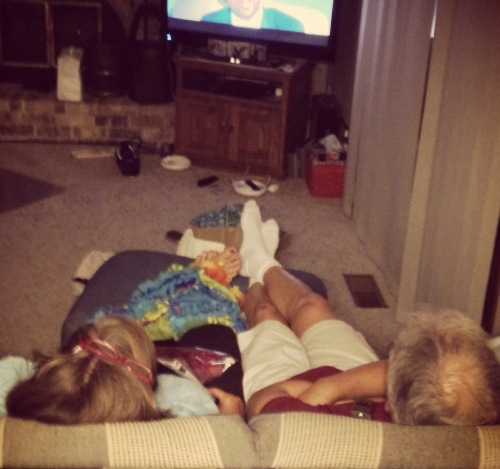 They were sitting on the floor leaning against the couch with the heads together. On the tv I saw what looked like a blue collar comedy show playing, one with Larry the cable guy. I slowly moved closer to see what was happening. I was right in thinking my mom was crying, only she wasn’t crying because she was sad, but because she was laughing so hard. My dad had is hand over her mouth trying to stifle the loud breathy crying laughs so as to not wake us kids. After a few minutes he had given up and started laughing along with her. I was overwhelmed with happiness. The previous few months had been trying on my mom and dad’s relationship. Seeing them like this reaffirmed to me that what they shared was love. They, like many other relationships, had their ups and downs, but at the end of the night they were able to laugh together like young kids in love all over again. Great little story and so nice to see the mum and dad full of laughter and happiness, bet the kid was smiling with them. Stability is an underrated commodity. Great read and thank you for following to bring me here.